Diane Zielinski bought a used car for her 17-year-old son at a dealership in Quakertown, Pa., about a decade ago. She paid $3,500 for the maroon Pontiac Grand Am. Three weeks later, her son called from a dark country road at 9 p.m. He had heard a loud bang, and then engine on the car had blown apart. "There were pieces of engine and oil all over the ground," Zielinski recalls. "He could have been hurt." While Zielinski called the dealer, her son came across the website for Carfax, a nationwide database that tracks vehicle histories. He entered the Grand Am's vehicle identification number, and learned that his car had been flooded in New Jersey during Hurricane Floyd, declared a total loss, and given a salvage title. Somewhere along the line after that, a clean title had been forged. Used car buyers should be on the lookout for flood-damaged cars following Hurricane Irene, one of the most destructive storms to hit the East Coast in decades. About half of flood-damaged vehicles find their way back to market, says Chris Basso, Carfax spokesman. 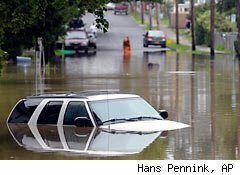 Flooded vehicles are dangerous because the water damages the mechanical and electrical systems that control safety features. That means anti-lock brakes and turn signals can fail, airbags may not deploy in an accident, or -- as in Zielinski's case -- the entire engine can simply blow up. "It's almost a ticking time bomb in terms of what's going to go wrong," says Alec Gutierrez, manager of vehicle of valuation at Kelley Blue Book. Health issues are another concern. "This isn't Deer Park spring water that flooded the car," says Basso. "It has chemicals and filth that gets into the seats and ventilation, and can result in a buildup of mold and bacteria." How do these cars wind up back on the market? Typically, an insurance company claim is filed on a flooded car, and it's declared a total loss or repaired. That information is reported to the state department of motor vehicles, and a "salvage title" is issued. Most of those vehicles are refurbished and resold through salvage auctions, and properly branded with full disclosure. But a salvage dealer can purchase the car and move it to a state that doesn't track that information, resulting in a clear title from that state, says Philip Reed, senior consumer advice editor for auto information website Edmunds.com. "When it's resold, the next buyer wouldn't know its history," says Reed. "We have 50 states and not all of them talk to each other. Sellers take advantage of that." Sellers can also forge a fake title or try to alter the real one (the term "title washing" comes from a chemical scammers once used to remove the ink of the title brand). Used car shoppers should check the VINs of any car they are considering at Carfax, or the National Insurance Crime Bureau to see if the title has ever been branded. If so, walk away -- there are plenty of other choices. The other source of flood-damaged vehicles are individual sellers, who market the vehicles online or on the side of the road. "You could have a car that sat in standing water and then the owner tries to turn around and sell it," says Reed. "There will be no documentation of this, so the subsequent buyer would have to detect it by physical evidence on vehicle itself." That evidence can include discoloration in the interior upholstery or carpet, or fabric that's been recently replaced; brittle, dry or flaky electrical wires under the dashboard; soot or rust in the trunk or engine bay; and a musty, mildewy or overly perfumed smell, says Gutierrez. When turn on the ignition to take a test drive, make sure all of the warnings and accessory lights turn on, says Gutierrez: "If the lights are flickering or not working properly it could be another warning about electrical system." The best line of defense is to take the vehicle to a mechanic you trust to check it out. When she saw the recent floods, Zielinski's thoughts turned back to her family's experience a decade ago; she's worried other used car buyers will confront the same scam. "What upset me more than anything was to think my kid could have been hurt by buying this car," she says. "Anything could have happened."